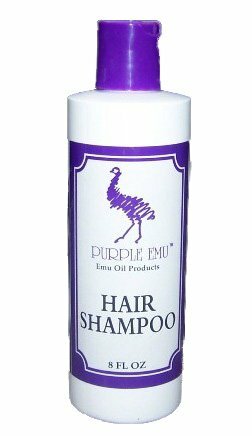 Purple Emu Hair Shampoo With Emu Oil 8 oz. Bottle. Gentle cleansing action and pleasing aroma. Special cleansing formula containing pure Emu Oil softens your hair, adds body and will leave your hair luxurious. Apply to wet hair and lather; rinse; repeat. Stepanol WAT, Stepanol WA, Water, Ninol 40-C, Sodium Lauryl Sulfate, Emu Oil, Germaben II, Fragrance, Sodium Chloride.